20110608 - Up in the Am, checked work and got things rolling, then back to D&J's school for the end of year award ceremony/graduation. As the awards were being called out my boys surprised me! D got an attendance award, an award for more As than Bs, and a 'Silver Presidential Award' sign be Barack Obama :-o Then J amazed me; he was nominated by the kids in his class as 'The One' fron his class that was nicest and most helpful through the year. 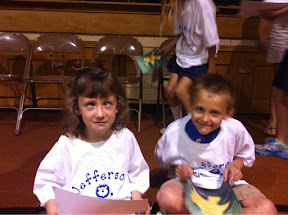 The girl chosen from his class was his buddy Meredith. Back home and at the desk. 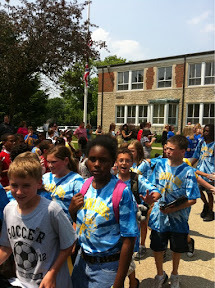 Took another break towards the end of the day to see the 5th grade walk out: that is where all the underclassmen line the front sidewalk of the school and the 5th graders parade the sidewalk to cheering, high-5s and weepy mothers flashing pictures.